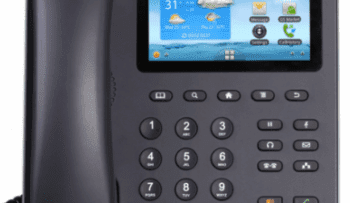 The Grandstream GXV3175 Multimedia IP Phone represents the best the industry has to offer, in a multi-function IP phone that takes full advantage of VoIP's web connectivity. The GXV3175 Multimedia IP Phone has the appearance of a tablet, and the talent to match. Featuring a color LCD display with 7” resistive touch screen, it handles media through dual USB ports, SD/MMC/SDHC, in addition to stereo audio and video outputs. The interface is very easy to use, and allows for full customization and integration through a wealth of options, all delivered in rich multimedia. Although this might start to sound like a biased advertisement, it's a simple reporting of the astounding capability the phone possesses.